Blog design and layout is the first thing your blog visitors see when they arrive on your blog. In fact, even before they see your content. First impressive is the last impression. Therefore, it is imperative for you to maintain a clean and attractive blog. Above mentioned factors work in tandem with each other and render your blog to your visitors. Even if one of the above mentioned factors is not in your favor, your luck is not going to come in your favor. Image if you land on some blog, it is taking longer than expected to load or images are cluttered or its not readable, would you spend any time on it? Forget about purchasing anything from it or visiting it again. Blog design plays an extremely important role in making sure that your visitors make purchase using links on your blog or visit it again. If you are a wordpress user, then you have got luck in your favor. If you are thinking why, then you have got Cherry on the top of your blog. Cherry Framework Review-What is Cherry Framework? Cherry is one of the most successful wordpress theme frameworks. Premium WP themes are one of the best ways to add punch to your blog and with cherry, your blogs go an extra mile as far as design, readability and speed is concerned. Bootstrap is a powerful framework for developing mobile friendly Web Template. It is well designed, light-weight and faster. You can control every aspect of your website like Website Layouts and design which is the most important factors for user friendly front end. Template Monster use Bootstrap to develop website templates which are beautiful, unique, cross-browser compatible and mobile responsive. Concept of WordPress and Bootstrap Template has been very well used by template monster to create these beautiful themes. Cherry Framework and bootstrap eases the process of WordPress Theme Design.Cherry framework for wp themes is a creation of template monster. Template monster is one of the biggest market place for themes and website templates. Template monster creates all kind of website templates and not just, wordpress themes. Therefore they have got the required skill set and expertise in the area of website template development. They have enough infrastructure and support team to support templates and wp themes at such a large scale. Cherry framework provides the base for template monster themes which ride this beautiful and powerful framework. Cherry it-self is capable of supporting theme and default design itself is enough for many blogs. It is light-weight and support better page speed which is essential for better seo rankings. There are thousands of themes which are supported by cherry framework. I have done reviews of other wordpress premium themes and frameworks. I am not aware of any other framework which is capable of supporting so many themes. Let’s take a look at Cherry Framework’s admin dashboard which is full of features, i can’t put too many images so i m restricting the numbers but this template monster wordpress theme is real monster template. Inspire theme from template monster is an artist portfolio response themes. Responsive theme mean it has capability to modify display setting based on the device which user is using to access your website. Mobile responsive wp themes are the future as more & more people are using mobile devices to use internet. Older themes are not capable of modifying their layout and design which cause distorted view on mobile devices. This could be lethal for your blog. Therefore no matter what theme you use, it has to be mobile responsive if you want it to grow and sustain. So coming back to inspire theme from template monster review, at very first glance, you will realize that it is simply ‘beautiful’. I am sorry I couldn’t get any other word to describe it. 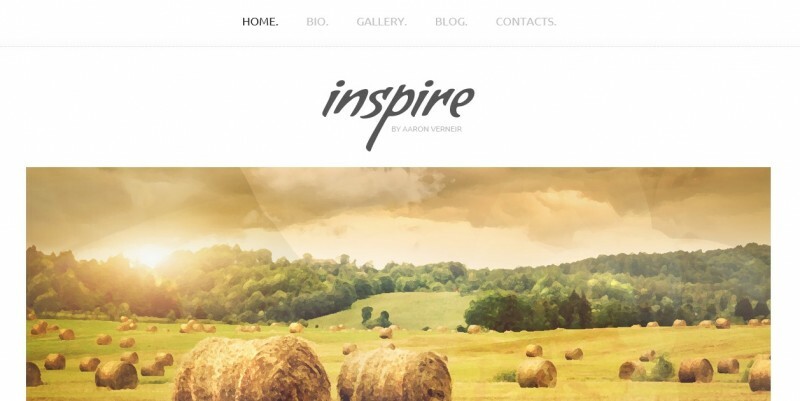 Inspire theme is one of the most beautiful premium wordpress themes. 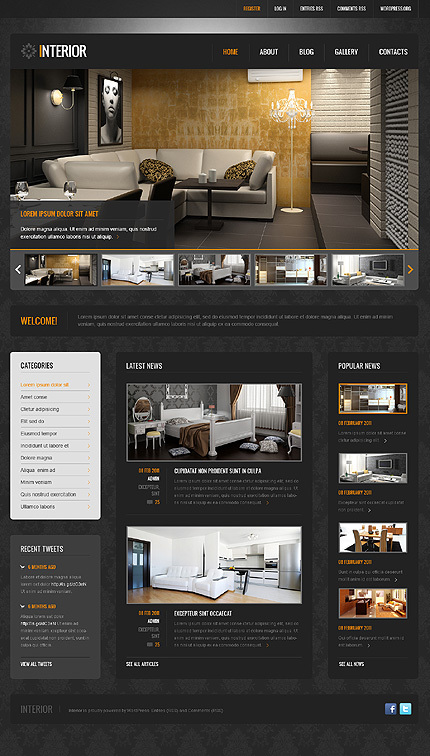 Inspire theme is not an ordinary theme which provides only basic design and layout capabilities. Testimonial section to customer testimony, reviews & feedback etc. FAQs to easily add FAQs to your site. I haven’t seen this functionality to any other theme. Our Team to add team/staff details which can make your website look more professional and therefore reliable. 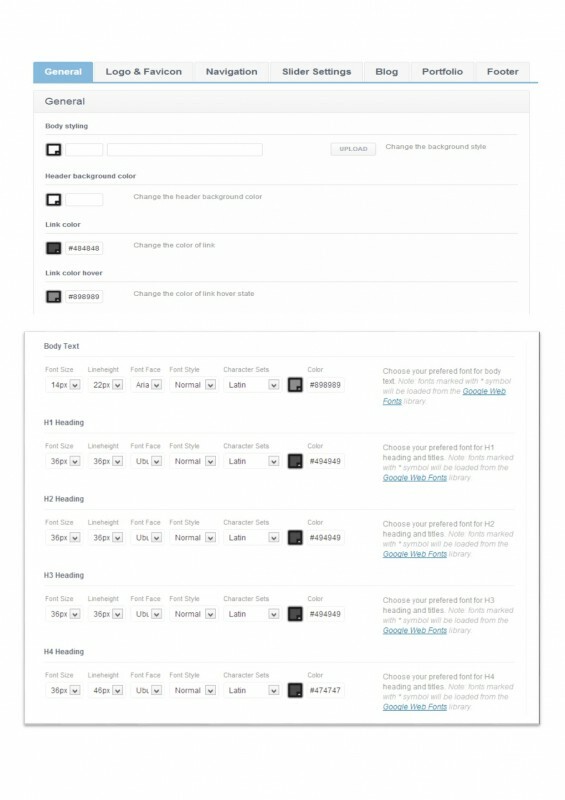 General settings to configure every aspect of your blog like font size, family etc. Artist Portfolio Responsive WordPress Theme #46088 or Inspire theme from template monster is a simple premium wordpress themes. I have said it earlier, but I am reiterating this point to elaborate the fact that this theme can convert your simple wordpress blog to a fully-fledged website. Now let’s take a look at some of other mobile responsive blog themes from Template Monster. It is a beautiful wordpress theme based on cherry framework. It is designed while keeping images and fonts in mind. You can literally see the way images and text is highlighted & well presented to you. 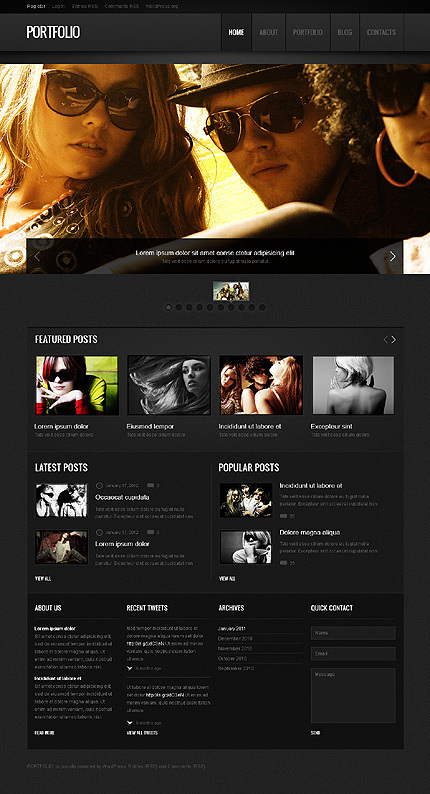 It is primarily a wordpress blog theme which can be used by any blogger who is looking for an attractive theme. 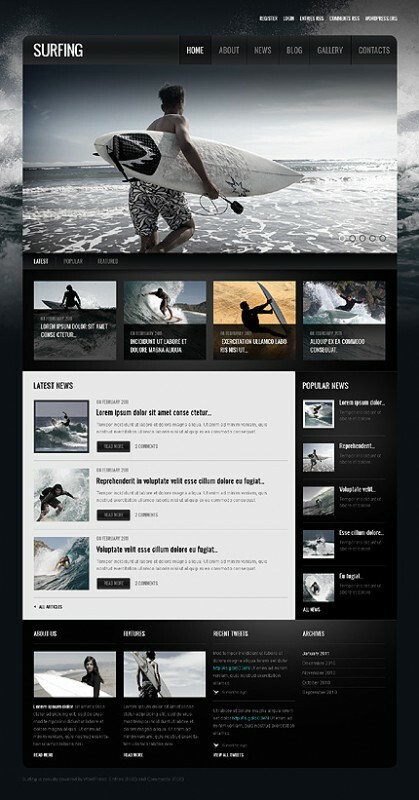 WordPress theme #39074-Surfing is ideal for blogs which involve equal usage of images and text like sport blogs. Interior decoration is one of the hottest markets in the world and yet, there is hardly any competition as far as interior decoration blogs are concerned. So if you are running a interior decoration blog or looking to setup a interior decoration blog, then design has to be a important part of it. After all, it’s all about decoration. Therefore you need a well designed wordpress theme for your blog. WordPress theme #42065 for template monster is a perfect theme for your decoration related blogs. 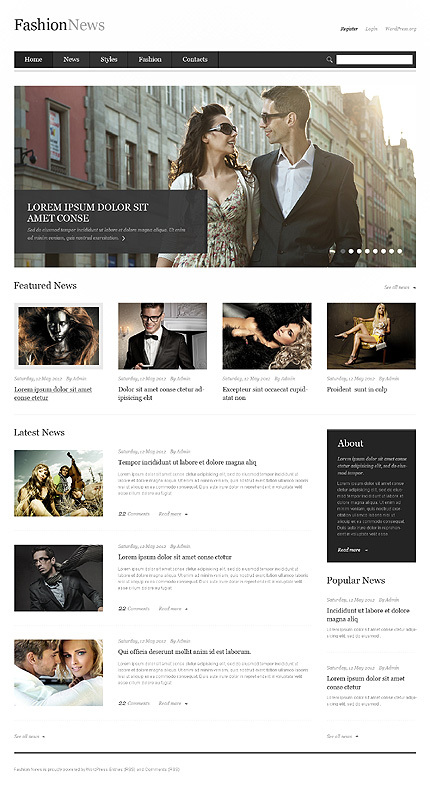 As the name suggest, this wp template is ideal for blogs based on latest fashion trends and news. You can easily organize your content and images in the best possible manner. As all the themes mentioned here are mobile responsive, you don’t have to bother about your blog’s looks on different devices. You can customize everything on your blog. It is one of the best portfolio management wordpress templates you will ever come across. This wordpress theme has got a huge slider at the top with animated effects which further add value to your design and looks. You can put your popular posts, tweets, contact details and other information in a very visually appealing manner. It is one of the best wordpress themes for photographers. Small businesses require great online presence to boost their business, irrespective of the sector or niche they are targeting. Website is the most important part of their online marketing and promotion strategy. This theme from template monster provides everything to present your business and company’s detail in a extremely efficient manner. You can high-light your products and services. You can talk about your company’s details. Small business need to put their contact details like address, phone number and email address on their website. With this cherry based wordpress theme, you can easily do that. You can also put a contact us form on your website without knowing any technical skills. And remember, this theme is mobile responsive, so your customers can access your website on tablets and mobile phones without any issue. 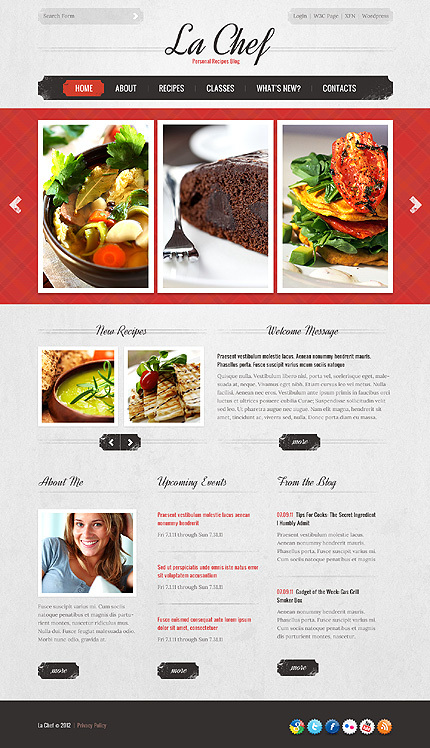 This theme is ideal for small businesses website. This theme from template monster is indeed a monster template if you are looking for design to die for, It has got a beautiful slider at the top of the home-page which can be used to display your featured posts about recipes, dishes and food item. Images are going to be very important for such blogs and this theme leave no stone untouched in making sure that you create a killing recipe blog with this premium wordpress theme. Note- when you visit the demo of above mentioned templates, don’t forget to check the display of theme on different devices like laptops, mobile phones and tablets to get a fair idea about the display. How to Install Cherry Framework along with Template Monster Child Themes? After making your purchase, you will get a download link with password. Store this password carefully as you will need that during un-zipping the file. Once you receive your download link, simply download the file. You will get zipped file. Now unzip it. After un-zipping, you will find a theme folder in it. Now navigate to wordpress admin dashboard and click on install theme under “Appearance” tab. 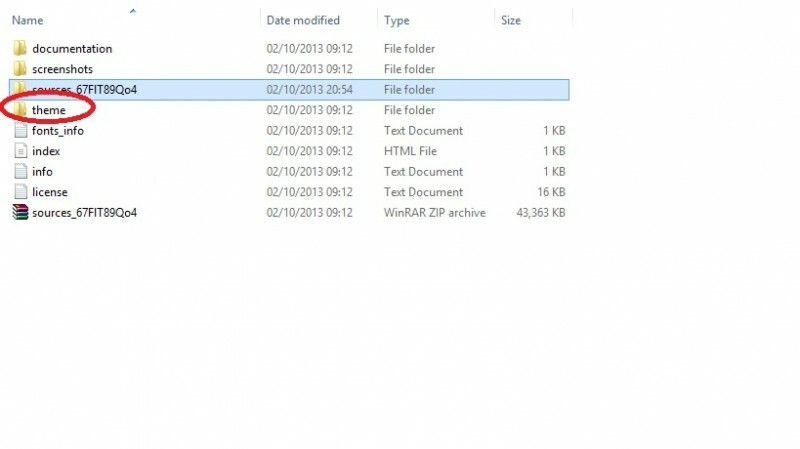 simply upload the cherry framework zip file first and then, theme46088 zip file. After uploading theme46088, just activate it and you are ready to rock n roll. Inspire is portfolio theme hence it is a perfect theme for websites which are images/photo driven and have got a product portfolio. 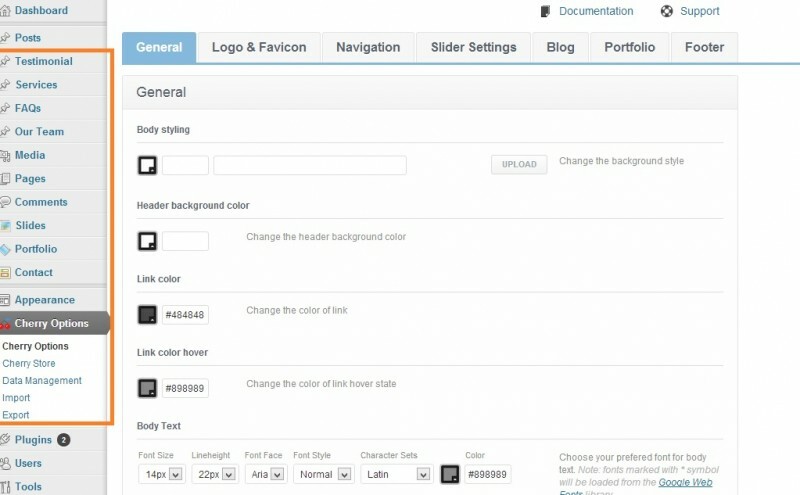 There are many features which can be used by bloggers also like in-built slider. You may have to spend some buck to get some slider plugin whereas with inspire theme, it’s already there. As mentioned earlier, it is more appropriate for webmasters who are setting up a fully-fledged website for small business or a photo blog. You will be overwhelmed the moment you start exploring the features offered by inspire or theme# 46088 from template monster. Please share your opinion, feedback or review of cherry framework & other Template Monster Templates mentioned here. I want to make a child theme in cherry framework. Please help me how to made this. Please share some tutorial about cherry framework. These themes are absolutely perfect, I think. But I’m afraid that they are paid items.